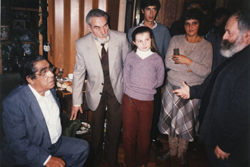 George Costakis, Mikhial Grechishnikov, Natalia Kolodzei, Aleksei Panin, Natalia Shmelkova, Mikhail Shvartsman, Moscow 1986. 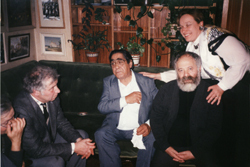 Ilya Kabakov, George Costakis, Mikhail Shvartsman, Svetlana Zavadovskaya, Moscow 1986. 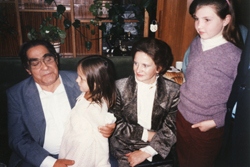 George Costakis, Daria Costakis, Larisa Shkhvatchabia, Natalia Kolodzei, Moscow 1986.
dedicated to the 90th anniversary of the distinguished collector of Russian Art George Costakis on Tuesday, July 15th at 6 PM at Moscow House of Nationalities, Novaia Basmannaia Street, 4, Moscow, Russia. George Costakis (1913-1990) is a legendary figure in the history of Russian art collecting. He was born on July 5th, 1913 in Moscow and lived in Russia most of his life, remaining a Greek citizen. He started his collection as a continuation of pre-Revolutionary traditions Russian icons and old paintings. Thus he was not new to art collecting in 1946, the year he stumbled across his first works of avant-garde art by Olga Rozanova. Then he began seeking treasures of the Russian avant-garde. With the acquisition of his first avant-garde paintings, Costakis found a focus and purpose for his collecting: to bring out of obscurity the achievements of a group of Russian experimental painters who had been active during the period from 1910 to 1930. George Costakis collection of Russian art featured the works of leading twentieth-century avant-garde artists such as Liubov Popova, Gustav Klucis, Marc Chagall, Kazimir Malevich, and Wassily Kandinsky. Later in his life, Costakis collected and supported the works of contemporary artists, such as Anatolii Zverev, Dmitri Plavinsky, and Dmitri Krasnopevtsev. When he left Russia in 1977, he donated the best and the biggest part of his collection of Russian avant-garde art to the State Tretyakov Gallery, where today many of its finest 20th century works are labeled "Donated by George Costakis." During much of Costakis' lifetime, the art of Rodchenko, Malevich, Popova and many others was not displayed in any official museum. They were kept in storage facilities which were closed to the public. These facilities were treated as if they were secret military sites, like silos with atomic weapons. One could not even say the word abstraction out loud; it was a term employed only by hostile ideology. The only places to view the works was in private collections. The warm, friendly atmosphere at Costakis par apartment attracted many visitors, including Senator Edward Kennedy and David Rockefeller, many artists, poets, and musicians. It became one of few places where it was possible to see works by Russian avant-garde artists. This exhibition is dedicated to Costakis and his times. At the exhibition there are 50 documentary photographs and a selections of 60 works by Anatolii Zverev, Vladimir Yakovlev, Dmitri Krasnopevtsev, Vladimir Nemukhin, Lydia Masterkova, Franscisco Infante, Viacheslav Koleichuk, Ilya Kabakov, Valeri & Alexander Volkov, Vladimir Weisberg, Vladimir Yakovlev, Mikhail Shvartsman, Eduard Shteinberg, and many others, from the daughter of George Costakis, Natalia Kostaki and his son-in-law, Vladimir Zazhirei, and from the Kolodzei Collection of Russian and Eastern European Art (Kolodzei Art Foundation, Inc.).